These switchers connect multiple HDMI input sources with several display devices. With local, cabled and IR remote control switching, they are intended for commercial and residential AV systems, digital signage, IT and control room applications where it may be necessary to distribute HDMI content to multiple display devices. The HDMI 1.4 switchers are HDCP 1.3 compliant and support up to 4K UHD (3840 x 2160) at 30Hz, 1080p at 120Hz, 3D and 48-bit deep colour. They also support LPCM 7.1CH, Dolby TrueHD, DTS-HD Master Audio and Dolby Atmos. They are cased in a metal enclosure. A series of EDID (Extended Display Information Data) management modes provide some user control and define how EDID information is managed. EDID is 'carefully handled by the HDMI Matrix to provide a single EDID for each source to read'. The 500442 is a 4x2 matrix switch. Four HDMI inputs can be routed to up to two HDMI outputs. Remote switching and control is via a 9-pin D-Sub RS-232 socket and 3x IR sensor inputs via 3.5mm sockets (two for use in a remote location alongside display devices, and one for local installation). Independent push-button control is also provided for simple manual switching. A series of LEDs indicate which of the four HDMI inputs is being routed to each of the two HDMI outputs. Up to four IR emitters can be connected via 3.5mm socket for remote control of source equipment such as DVD, Blu-ray players and set-top boxes. A series of four DIP switches are used to configure EDID management. Included accessories: 5V DC power supply, IR remote control, RS-232 cable, 3x IR sensor, 4x IR emitter, wall mount bracket. 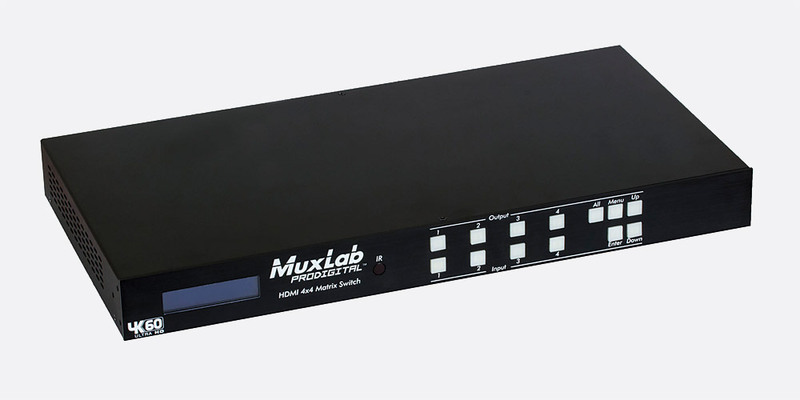 Otherwise similar to the 500442, the MuxLab 500440 is a 4x4 matrix switch. Four HDMI inputs can be routed to up to four HDMI outputs. 5x IR sensors and 4x IR emitters can be used for remote control. Included accessories: 12V DC power supply, IR remote control, RS-232 cable, 5x IR sensor, 4x IR emitter, wall mount bracket. Intended for larger, more complex systems, the 500441 is an 8x8 matrix switch for HDMI signals. Functionally similar to the 500442 and 500440 matrices, the 500441 accepts eight HDMI inputs which can be routed to any or all of eight HDMI outputs. An RJ45 socket is provided in addition to the RS-232 socket for remote monitoring and PC control. In addition to the audio embedded within the HDMI output, the 500441 extracts audio from the HDMI inputs and presents it separately via corresponding coaxial (S/PDIF) sockets. Audio extraction may be particularly useful in sports bar and visitor centre applications where external amplification and loudspeakers are required. An LCD screen shows the status of input/output selection and EDID information. 9x IR sensors and 8x IR emitters can be used for remote control. 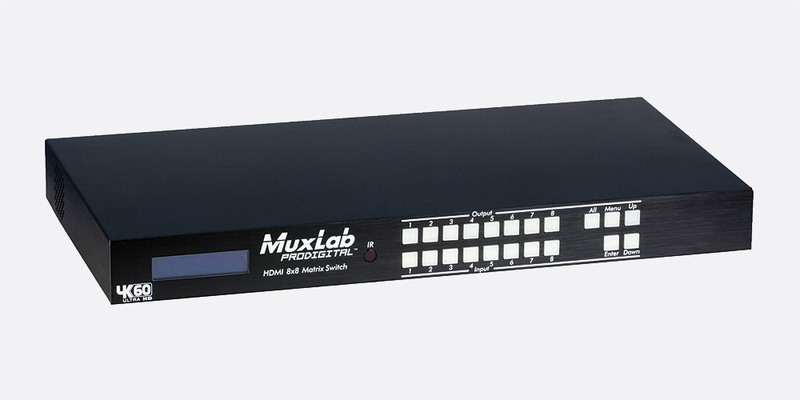 The MuxLab 500441 can be rack mounted in 1U of space using the supplied hardware. Included accessories: 12V DC power supply, IR remote control, RS-232 cable, 9x IR sensor, 8x IR emitter, rack-mounting bracket. 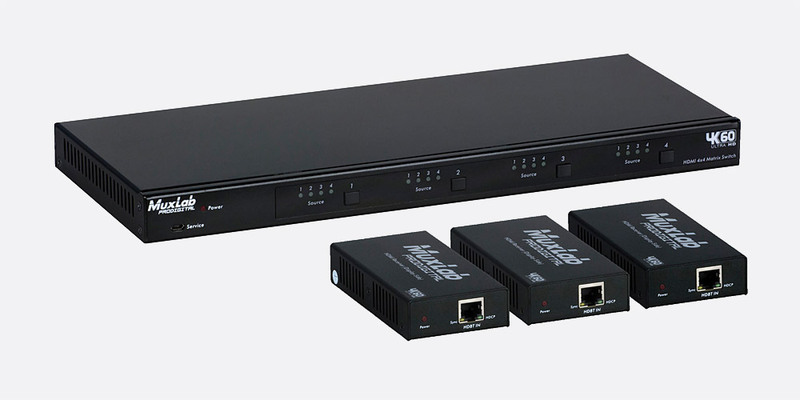 This 4x4 HDMI matrix supports 4K/60 (4:4:4) and conveniently routes up to four HDMI source inputs to up to four HDMI outputs for connection to compatible displays. Any source is accessible by using the included IR remote control, RS232, TCP/IP, or by using the selection buttons located on the front panel. As well as supporting 4K 60Hz, the 500444 supports 3D formats with independent EDID control by way of connected PC controller. Audio formats include LPCM 7.1CH, Dolby TrueHD, Dolby Digital Plus, Dolby Atmos, DTS-HD Master Audio and DTS:X, with coaxial digital output on S/PDIF. The 500444 has a metal enclosure that can be used on a desktop or rack mounted in 1U space when using the mounting brackets included. Control buttons and LCD display located on the front panel allow the user to control any changes to the settings, including EDID mode. The rear panel houses 4x HDMI inputs, 4x HDMI outputs, 4x RCA coaxial digital audio outputs, RJ45 for control via Ethernet connection, 3.5mm jack socket for infrared sensor, and DB9 connector for RS232 control. Included accessories: 12V DC power supply, IR sensor cable, handheld IR remote, rack-mounting ears. Similar to the 500444, this has 8x8 matrix compatibility. This kit includes 1x 500412 4x4 matrix hub and 3x 500412-RX HDBT POC (power over cable) receivers. The operator can use the matrix switch to route up to four HDMI 2.0 source inputs and distribute them to up to four connected displays. 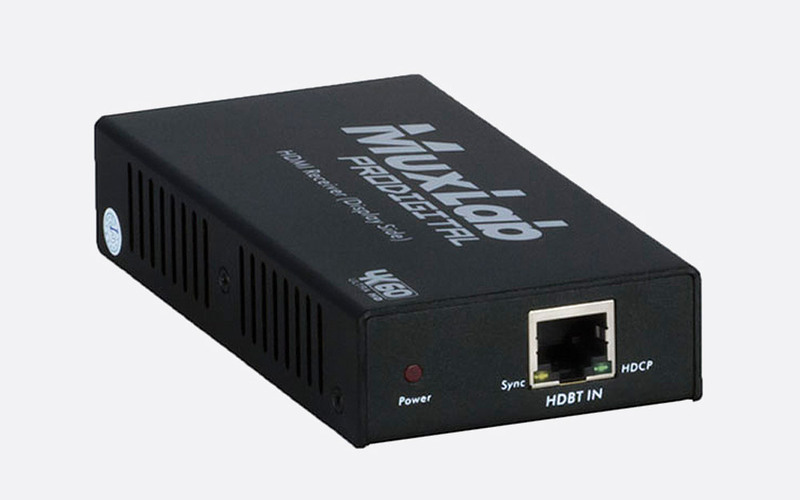 The matrix switch also supports three HDBT outputs for connection over longer distance of 70m (for 1080p) or 40m (4K) via Cat5e cable to the included 500412-RX receivers, which are then powered from the matrix switch via 24V DC PoC. Audio formats supported include LPCM 7.1CH, Dolby TrueHD, Dolby Atmos, DTS-HD Master Audio and DTS:X with RCA outputs for analogue audio, and TosLink optical output for digital audio. The rear of the 500412 matrix switch has all I/O connectivity including 4x HDMI inputs, 3x HDBT outputs, 1x HDMI output for local connectivity, S/PDIF, IR sensor and IR emitter connections and dual RCA (phono) analogue audio outputs. In addition, an Ethernet connection (RJ45) can be used to access the built in GUI web interface for full control via connected PC. Power is by way of 24V DC power supply with 2.1mm locking barrel connector. The front panel has LED status lights, four per input source and four output selector buttons. 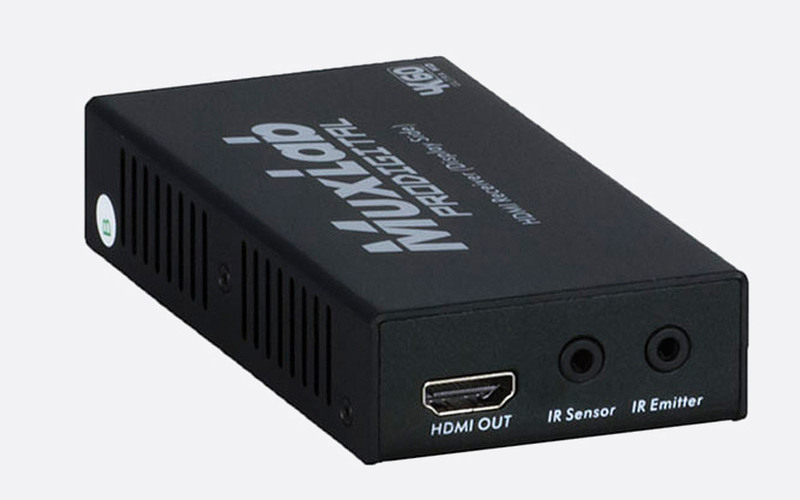 The 500412-RX receivers have HDMI output, IR sensor and IR emitter connections, as well as the HDBT connection. A red LED signifies PoC present. 500412 Matrix Switch dimensions: 360 x 28 x 150 (HxWxD) mm. Weight: 0.91Kg. 500412-RX Receiver dimensions: 61 x 24 x 120 (HxWxD)mm. Weight: 0.28Kg. No longer manufactured. Please contact Technical Support for advice on alternatives.